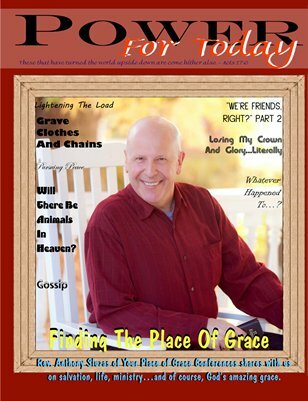 Power For Today Magazine is published quarterly and is a publication of Apostolic Fellowship International Ministries. Second Quarter 2016: Finding The Place Of Grace, featuring the interview with Rev. Anthony Sluzas, founder of Your Place of Grace. Cover feature: Pursuing Peace. Articles by Apostle Dr. Lee Ann B. Marino, Pastor Emma Weatherington, Prophetess Nina B. Marino, Pastor Veronica M. Downing, Minister Angie Littlefair, and Apostle Besceglia Y. Hall.